Several massive reshufflings in key government positions took place in Kazakhstan as early as first days of 2013, and that certainly bears crucial impacts on the country’s future. On the surface, reshuffling of officials is not a novice in our country and the Kazakh society is quite used to this frequent phenomenon. Many realize that Kazakh President Nursultan Nazarbayev resorts to this method to maintain the balance of power among the elite in region. The latest reshuffling, to be sure, was different. The maneuver resulted in an unconditional dominance of the presidential power throughout the political system of Kazakhstan. Before the move, Aslan Musin, the former head of the presidential administration, held practically all reins of governance, having appointed his trustees in top positions in central and regional echelons of power. Regional akims (heads of administration) launched policies and activities that were different from that of the president and treated their respective regions as private fiefdoms. To be sure, the majority of the ruling elite shared the sentiment. One of the reasons for the abuse was the rumor that changes were about to happen in the highest echelon of power. 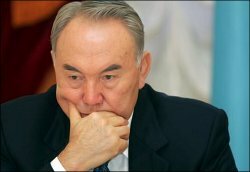 Rakhat Aliyev, the Kazakh president’s former son-in-law, claimed that Nursultan Nazarbayev was suffering from prostate cancer. 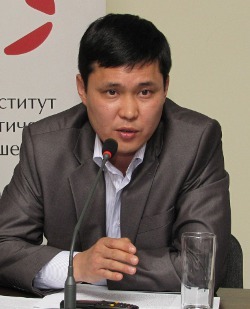 The purported probability of power transition was further consolidated by early presidential elections in April 2011, Yermukhamet Yertysbayev’s statement that Timur Kulibayev, another “first” son-in-law, would potentially succeed Nazarbayev, and other claims. The tragedy in Zhanaozen was a response to the upcoming post-Nazarbayev paradigm primarily. So were the supposedly terrorist acts over the last several years. It is noteworthy that the majority of those terrorist acts aimed at exposing the National Security Committee’s (NSC) incompetence to deal with such events. It is therefore quite possible that another aim these horrendous acts had was not only exposing the Kazakh authorities’ weaknesses, but also removing Nurtay Abykayev, the head of the NSC, as one of the candidates for becoming the second president of Kazakhstan. So, an inter-elite fight launches in 2011 as the first phase of the post-Nazarbayev era. The Kazakh political elites realize that the era will dawn, sooner or later. They must, therefore, be prepared now to ensure their interests’ immunity is guaranteed in the future. That warrants having political tools and leverages; access to and control over power-wielding bodies, that is. And this is the battlefield field the majority of inter-elite clashes are taking place at the moment. It seems that this was the triggering event that encouraged President Nazarbayev to reset and reload the political system by bringing order to the Kazakh ruling elites’ ranks: consolidating the president’s power and its dominance over regional and central authorities. The first phase of the process included removing Aslan Musin from his post, reshuffling of officials in the executive branch of power, power-wielding bodies, and retesting law enforcing officers. It is noteworthy that retesting law enforcers was launched before Musin’s resignation. He was, therefore, in charge of controlling the testing process. However, then-Prime Minister Karim Masimov was appointed head of the commission for overseeing the retesting. The administrative office of President Nazarbayev will continue playing a significant role in controlling regional powers. Apparently Gabidulla Abdhrakhimov, a recent appointee to the post of deputy head of the presidential administration, will be in charge of this. He gained much experience during his term in the agency for state service, which he will use to handpick individuals who will loyally serve the president. The new Secretary of the Security Council of Kazakhstan, Kayrat Kozhamzharov, gained experience in the financial police and prosecutor’s offices, and he can oversee the regional and central elites over colliding interests in controlling natural resources. It is quite possible that the reshuffling was planned back in late 2011 or early 2012. The transfer of Abelgazy Kusainov is a case in point: he was removed from the post of Governor of Karaganda Region to the unequal position of Chair of Trade Unions Federation. Apparently that is why Abelgazy Kusainov was first appointed to the Governor’s position in January 2012 [presumably from the position of Minister of Transport and Communications] before totally removing him from key positions; a very accurate work, indeed. Another key maneuver in consolidating the president’s grip can be seen in appointing Marat Tazhin as Secretary of State, who reports to the president directly. Apparently, Marat Tazhin will utilize this position to oversee domestic and foreign policies, its formation by the presidential administration and, obviously, report to the president. In other words, Tazhin will serve as a check to the presidential administration. At the moment, Karim Masimov is the “chief close person” to President Nazarbayev. It seems that having dealt with Aslan Musin, who concentrated too much power under his control, President Nazarbayev wants to have a balancing figure for Masimov in the personality of Secretary of State Tazhin. After all, it appears that the whole notion of Secretary of State was conceived of as a balance to the presidential administration. In other words, Secretary Tazhin will be President Nazarbayev’s eye overseeing domestic and foreign policies. For a complete “reload” of the political system and total reshuffling of the ruling elite, Kazakh President Nursultan Nazarbayev now needs to reshuffle other key state offices, particularly power-wielding agencies. There are indications that that plan will soon be implemented as well. President Nazarbayev’s meeting with chiefs of law enforcing agencies on 30 January 2013 is a case in point. At the meeting, the president and Prosecutor General Askhat Daulbayev criticized almost all of the law enforcing and power wielding agencies across the board. It is noteworthy that the judicial branch of power, the ministry for internal affairs and the committee for national security were lashed out mostly. It is a clear indication that these agencies’ and branches’ chiefs will be replaced soon. The consolidation of the president’s total dominance, or its restoration rather, can also be interpreted as a method of paving way for and ensuring an “eventless” transition of power in Kazakhstan. Looked at from this prism, Kayrat Kozhomzharov’s appointment can also mean the presidential power’s security and its transition would be achieved only in close cooperation with the Collective Security Treaty Organization. Lately, President Nazarbayev has been chairing meetings and delivering speeches, wherein he seemed to aspire to prove that he is capable of controlling and steering Kazakhstan, its elite and people. In a recent address entitled Kazakhsta-2050, the president has also spoken about the country’s strategy for development, which sounded like a living will to “heirs”—the Kazakh elite and society. All these factors allow one to conclude that the current reshufflings will continue into the future, and that this can be seen as Nursultan Nazarbayev’s attempt to peacefully transfer his power to the second president of Kazakhstan.